This awesome game by Capcom was actually designed to be the next instalment of the Resident Evil Series when they realised that the plot and scenarios were diverging too much to be faithful to that time honoured series. Thus enter Dante, and the title Devil May Cry. 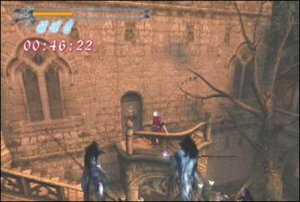 Dante is the half devil, half human son of Sparda, the Demon who turned his back on hell to rule earth in tranquility until his demise. When a mysterious woman named Trish arrives and hints at secret knowledge about Dante's parents and the evil that overcame them, Dante follows her to the Devil World to seek answers. 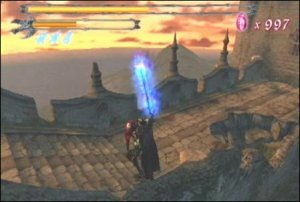 Devil May Cry is a beautiful game to play and it is hard to believe that you are playing in a 3D environment. The title screams style all the way through and there is an astounding attention to detail. Ultimately DMC is all about the way you dispatch your enemy and the way you go about doing it. You possess sword and gun attacks and can alternate between blows. An uppercut with a sword can get an opponent airborne and switching to gun mode can keep them up there until dealt with. Attacks are commented upon onscreen with words like Dull, Cool! and Bravo adding up to a final score upon a mission's completion. You collect orbs that you can use to purchase power upgrades for your weapons attacks. 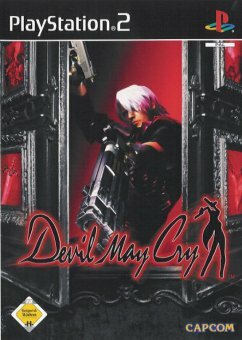 Devil May Cry is a 15+ title and rightly so however it should also be a part of everyone's collection of games who is into this genre. I must confess I was wary at first when hearing this was the Resident Evil engine powering the title however my fears were immediately laid to rest upon starting the game. I have in the past found the RE engine to be a bit cumbersome. But this is not the case. 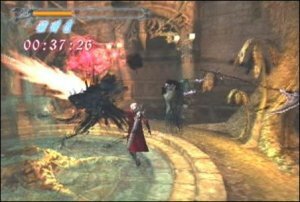 Get out there and play Devil May Cry today!